Following my weight loss update on the Why Weight Ireland Private Facebook Community Group this week, I received a few messages asking what are the main weight loss tips that have helped keep me going and why I am succeeding this time when I have failed so many times in the past. The lessons I’ve learned over the previous nine months while losing just under 5 stone (so far!) are many and when combined have gifted to me a more balanced and sustainable approach to my yearned for weight loss. Using a food & exercise diary – The main practical and pivotal tool that ensures consistent weight loss for me is honestly keeping track of my food intake by using the Why Weight Ireland Food & Exercise Diary. When I update my food diary religiously every day it helps keep me accountable and in control with my portion sizes. It helps me make wiser decisions, keeps me honest and teaches me the nutritional value of what I am eating. I had gained a massive amount of weight over the years due to my excessive over-eating so using a food diary is a crucial tool in helping me keep this in check, protecting my weight loss so far and ensuring continued consistent weight loss for the future. I also track my exercise and calories burned using the Why Weight Ireland Food & Exercise Diary, which has a massive database of exercises and workouts to choose from and there’s also an option for manual addition. Keeping a food diary can feel like a chore sometimes but it is a crucial daily discipline which holds me accountable. If you are a member and not losing weight then ask yourself one question: Am I REALLY using it like I should? Most likely you will answer NO. My advice – USE IT. I also record all my running and exercise training in the “Believe Training Journal” by Lauren Fleshman and Róisín McGettigan-Dumas. This journal/workbook is full of motivational stories and advice, with inspirational quotes and pages to record your goals and progress. After every run I record my pace, distance covered, calories burned, a breakdown of the session and how I was feeling. I find this a very positive reflective tool in helping me to acknowledge my efforts and accomplishments, particularly on a bad day, and affords me at a glance tangible and unarguable progress reports. Being able to reflect on how far I have come encourages me to own my achievements, strengthening my resolve to keep going. A consistent and sustainable exercise routine – I exercise 4 days per week, aiming to reach 5-6 days eventually, with maybe a simple walk on the seventh day, still burning calories but a rest day all the same from running and resistance work. At this stage I’ve learned that when I endeavour to work out every single day I become overwhelmed and resentful of sustained intense efforts and start skipping sessions, my commitment capsizing fairly rapidly. Now my focus is more on turning up consistently to training sessions and building up intensity and endurance over time, instead of feeling under pressure to crush each work out every single day. Preparing a weekly meal plan – Making the time to sit down to write up a meal guide for the week and shopping according to the menu ensures I have the security and structure of a plan and tend not to veer off track. My breakfasts usually include eggs, my favourite at the moment being scrambled eggs on a bed of raw spinach with mozzarella and sweet chilli sauce. I relish trying new foods and discovering new ways to prepare them. Over time I have added more nutrient dense foods to my diet and as blasphemous as this sounds, I tend to reach more for spinach or avocado now than my all-time favourite mashed spuds with Kerrygold! Changing your eating habits and incorporating more nutritious food takes time but eventually can become second nature and is more than worth it in the long run. If you aren’t sure about a recipe or a food item it is easy to just add it to the food diary. It will give you the information you need and help give you ideas on how to lower the calories of your recipe. Reining in the chocolate! – I am an absolute terror for chocolate and used to eat it every single day and lots of it. Now every evening I will have an Options Hot Chocolate which satisfies my sweet tooth and if I am feeling like I could gnaw my way through a brick wall for some, I will have a small children’s size Cadbury’s Dairy Milk to dip into the hot chocolate. Bliss! Learning self-compassion and kindness – When I have a bad day or week, when I’ve been wholesale dangerous altogether, instead of berating myself for taking a nose-dive off my plan, I get back up, learn from it and move on. It’s not the end of the world when I break out and indulge, just not too regularly as it only delays or stops me from reaching my goal. Beating myself up with punitive put-downs serves no purpose, only to bully myself myself and make myself miserable. Attempting to manifest a balanced healthy lifestyle from a place of self-loathing is very damaging and futile. Now I am making phenomenal progress by choosing to make changes and improvements to my life from a place of self-love and self-compassion. It’s scary and squirmy learning to love myself. It will always be a work in progress but it is making an incredibly positive impact to my life and is ensuring I look after myself with more kindness. Since I started on the project of learning to love myself, I am giving myself permission to succeed with my weight loss and fitness goals. There is more to life – Learning to live a healthy balanced lifestyle over the long term takes time, I can’t force it or rush it. I’m learning to stop obsessing over my weight as I acknowledge there is more to life than rigid focus on weight loss. A balanced healthy lifestyle is more than just food and exercise, it’s about looking after your relationship with yourself and with others. I keep in touch with friends and loved ones, touching base more regularly, whereas before I was committed to my food addiction and the safety of hibernation and isolation. Read that book, take that dance class, call that friend, make that date, learn to play that musical instrument, learn how to speak Italian – tend to whatever it is in your life that makes your heart sing and cherish whomever you breathe for every day. Ensure you keep your love alive for your passions and for the precious people in your life. Love and thrive NOW, stop putting your life on hold until you lose the weight. There is no quick fix to weight loss – I’ve stopped yearning for a quick fix. I invest my energy now in making wiser choices and banking my accomplishments along the way, focusing on following through on simple daily disciplines. I’m losing weight safely and at a steady enough rate. About 9 years ago I followed a meal replacement diet where I ate no food at all but had 3 shakes a day made up with flavoured powder and iced water. Over 9 weeks I lost 3 stone and was made up with myself altogether at such swift weight loss. But at what cost? I didn’t eat ANY food for 63 days!! Like, how incredibly dangerous and unhealthy was that, and all for the sake of losing weight as quick as possible? My metabolism was shot and my hair started falling out in clumps in the shower. 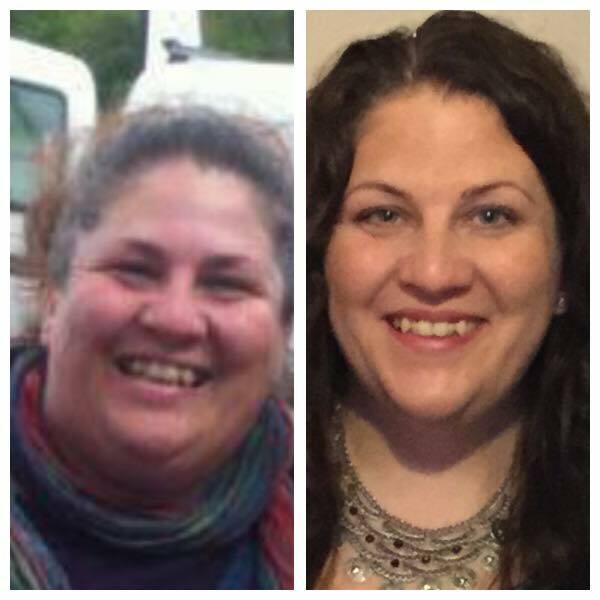 I was learning absolutely nothing about nutrition and as soon as I started eating real food again I horsed the weight back on again and many more stones extra, eventually becoming severely obese at 17 stone 10 pounds. Losing weight is not a sprint. It is a marathon. Being consistent – Following through with action plans, being consistent with exercise and eating healthily, despite any setbacks, helps to change habits over time and lose weight in the long run. Anyone can exercise a few days a week and prepare healthy nutritious food for a week or a few weeks or even a few months but learning to consistently follow through with the simple daily disciplines you have set out for yourself to reach your goal ensures that you can maintain your healthy lifestyle campaign and weight loss for longer and for years to come. Being consistent allows you to build up your new habits over time and generate a sense of accomplishment as you reach each mini-goal and rise to each challenge. I expect more of myself now and being consistent helps me raise my standards for myself, securing success for my efforts. Sticking with your action plan can be daunting when life gets in the way and you are stressed or exhausted or couldn’t be bothered but when you experience a few times the build in momentum when you pick yourself back up after taking a fall and continue on following through with your disciplines and plans you will see how easy it is to just do it and get your stride back. Learn to be consistent and never give up. Running Session One – I’m in top form for running tonight so did not have to force myself out the front door. Tonight’s session is 2 minutes easy run, 1 minute recovery, adding one extra minute to the running interval after each one minute recovery until we reach 4 minutes running and then bring the running section back down by one minute again after each one minute recovery, back to the 2 minute easy run. We then have a short water break and back out on to the track to repeat the same. Usually I keep my head down and get on with the running but tonight whatever has gotten into me I am all full of chat and am nattering away at the back of the pack so when Fiona laps me for the 3rd time I know that I’m not concentrating as much as I could be. My pace for the first 19 minute segment is 12:42/mi and for the second segment is 13:39/mi so a lot more chattering went on in the second half! I’ve made a mental note to not ignore my pace if my inner chatterbox makes an appearance on Wednesday night on the track. Running Session Two – The wind and rain has been crazy today and when I turn up to the running track it is water logged and the shelter has been blown over. Running session tonight so is on the road! Brilliant! I head off with two other women for a 3.5km run (just over 2 miles) and enjoy the experience of running out on the roads with companions to chat to. The chatting doesn’t last long after about the first mile as I slip to the back and one of the others starts to lead out in front. It is nippy out and it starts to drizzle as I try and maintain some sort of pace to keep up with the other two. That demonic hill on Cannery Road is on the route and as we are running out in peak time traffic, there is a line of very slow moving cars the whole way up the hill. If I have to roll into the ditch to recover I am getting up that hill without stopping or walking!! I keep an eye on Aileen and Ann ahead of me and watching them endure that hill spurs me on to the top, in ribbons but in one piece. We pass the tennis club and as we are nearly home I up my pace with a burst of energy and finish panting and puce red in the face but still alive. My pace is 12:48/mi overall. 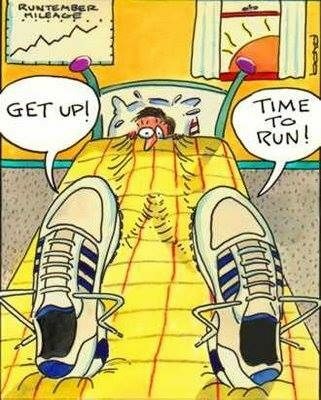 God, I love running! Strength & Conditioning Class – I miss my class this evening as my youngest son is receiving his First Confession. I could have done a workout at home but didn’t! Next week will be back to normal so I am looking forward to getting back to this fun but challenging class. Running Session Three – 6.7km (4.2 miles) run this morning at 9am and despite feeling like I am going to die at times, I keep going. This is my my longest run with the club yet and my longest run in years. I quake at the thoughts of some of the hills, mere inclines some of them but when you are knackered and struggling to get to the top, it can feel like Everest. As I watch the last runner ahead of me disappear into the distance, that I can’t even see their hi-vis clothes any longer, I mutter to myself that one of these days I’ll be able to keep up. Even though I know I am making great progress and that my pace is improving, it can still be disheartening to be so very far behind everyone else all the time. I’m not forlorn for long as I choose to be grateful to get to run at all. Every so often I try concentrate on lifting my legs higher, as advised by Gary last week, and it still feels awkward and I’m trying not to be furious with myself that my overhanging stomach is flip flapping up and down on my legs as I stay running. Every few seconds I want to stop, to walk, to call my sister to come pick me up and pet me with a breakfast roll. I want to finish though even more and stretch myself that little bit further out of my comfort zone so I choose to continue on. Running up the hill of Cox’s Lane was a pure suffering torment altogether. Only that it was so close to the finish, I fancy I may have packed it in before reaching the top. Another 6 minutes later I was welcomed back with a roaring beep! beep! from Coach Flannery in his car, and a fist bump and bear hug from another man who had finished well before me. The encouragement and cheering support in Adrenaline Running Club is incredible. The run takes 55 minutes with an overall pace of 13:09/mi and I’m feeling Olympic to have run over 4 miles in one go. Well, as you know I was hoping to lose just over 1lb at least this week to bring me into the “12 stone something” range. Well, I DID IT!!! 12 stone 12.5lbs on the scales and I’ve been swanning around the house like Twiggy ever since!! I’ve been stalling for a few months now between 13 and 14 stone and thought I’d never reach 12 stone something but here I am today. I can’t believe it. It’s so weird to see 12 stone on the scales again. I feel more normal, less defective (still working on those inner demons!). A loss of 2.5lbs this week and only 2.5lbs to go to reach a 5 stone loss. Dropping from my heaviest weight of 17 stone 10lbs on my tiny 5′ 2″ frame, this is an outstanding success for me. I’m laughing here to myself with giddiness as this progress seems so insane as it always had seemed impossible for me. I’m beginning to marvel at the fact that if I stay going like I am, that I will surely reach my ultimate weight loss target with another 4 stone 5.5lbs to go. It’s a surreal feeling. I’ve crossed over the half way mark now with 4 stone 7.5lb lost so far in total. I feel amazing! So don’t give up. Like me, you will have great weeks and they can carry you through but make friends with the not so great weeks, learn from them and most importantly, KEEP GOING, keep putting one foot in front of the other and you WILL make progress, you WILL reach your goals. It’s easy to stay going and do the right thing when you are seeing the great results that you want but when you don’t see the results you want, when you have a week where you ate all around you or skipped exercise classes or were too contrary to care, those weeks are hard to get past but you must choose to learn from them, get back up, and KEEP GOING. Just like the recent success story on the Why Weight Ireland website from Cinzia, when she felt down she just dropped an email to Hannah and talked it through. 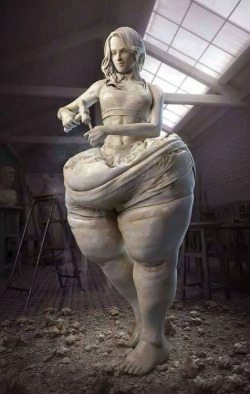 Before she knew it the weight continued to fall. If I had given up every time I had a bad week or a gain on the scales, I wouldn’t be close to a 5 stone loss now, and more than likely would be heavier than ever. That’s what I’d always done before, fallen and stayed down. Yep, I’ve had a few weeks where I’ve gained, even more weeks where I’ve maintained and for the last 3 months I’ve been very slow, stuck around the same weight, gaining and losing the same few pounds, but chose to keep going, no matter how slow, and have finally started to build back up the momentum. KEEP GOING & use the tools you have as a member! 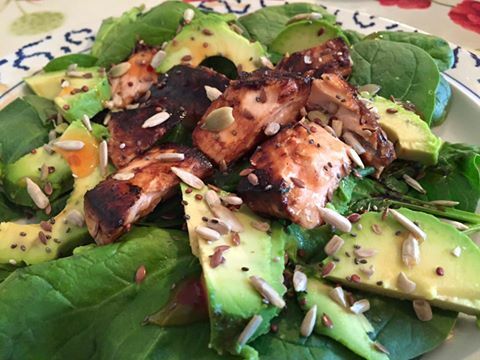 I’m addicted to raw spinach and avocado lately so teamed up with salmon this makes a delicious and nutritious meal that you can rustle up in a matter of minutes. 422 calories per serving. Serves one. Enjoy! Place the salmon fillet in a small bowl with the Teriyaki sauce and leave to sit for about 20 minutes. Plate up your spinach and avocado slices and set aside. Spray a non-stick pan with Frylight and cook the salmon fillet, flesh side down, for about 4 minutes. Watch this like a hawk. I find it hard to gauge sometimes the intensity of the heat needed so I don’t burn it, starting off at a high heat for about 30 seconds and then turning heat down to medium. Turn the salmon fillet to skin side down and cook for a further 4 minutes on medium heat. You can transfer the salmon as is to the plate but I usually remove the skin and chop the flesh into small chunks, placing them into the middle of the spinach and avocado salad. Top with your Good 4 U Super Seed Sprinkles and a drizzle of the sweet chilli dipping sauce. Right guys, we need your support. 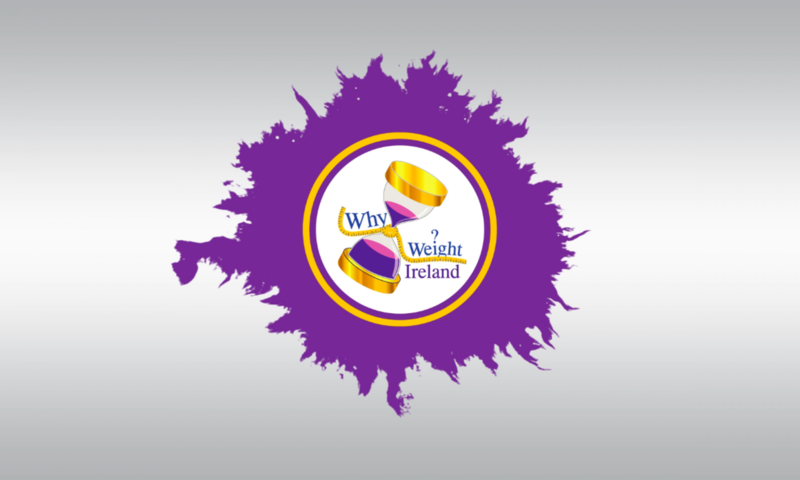 We need you to help share Why Weight Ireland to everyone you know. We need to show that Why Weight Ireland WORKS so if you know anyone (which we ALL do) that is looking to lose weight then PLEASE do advise them to join Why Weight Ireland.